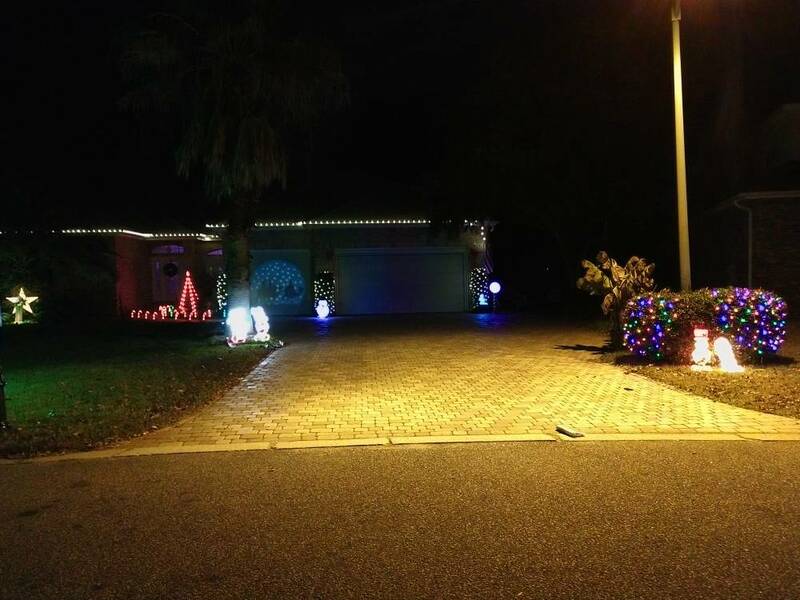 Street lights - DIY Do It Yourself - PlanetChristmas! Anyone have a street light in their yard? Any ideas on what to do with this? The light isn't too bright, so my lights are visible. But if like to dress it up next year. Assuming I don't get in trouble for doing so, what could I do? I thought of wrapping with red ribbon to about 10 or 12 feet up, but maybe there's something better? 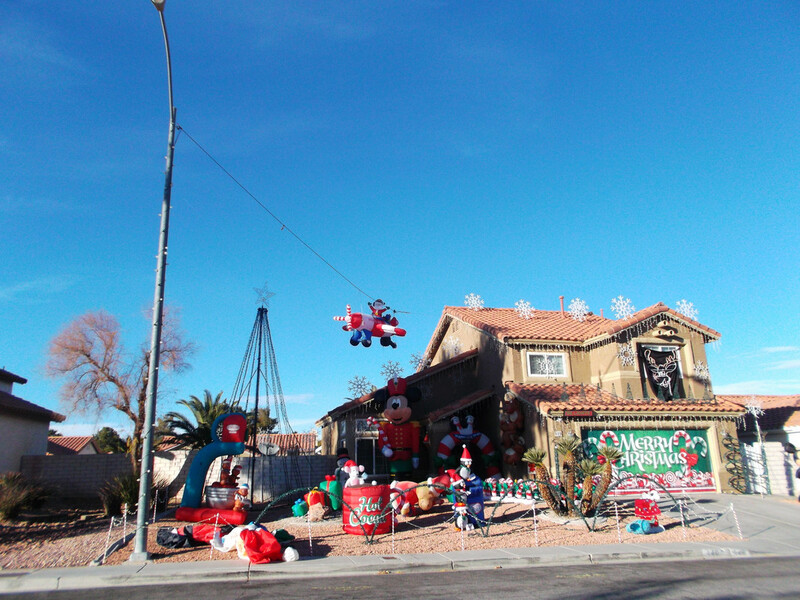 My neighbor, the guy who must spend about a grand each year on his display, uses the streetlight in front of his home as an anchor for one end of the cable that supports a Santa plane while the other end is attached to the top of the house. He also spiral winds large lights around the pole from top to bottom. Apparently Clark County does not mind as he has been doing this for several years with no consequences. 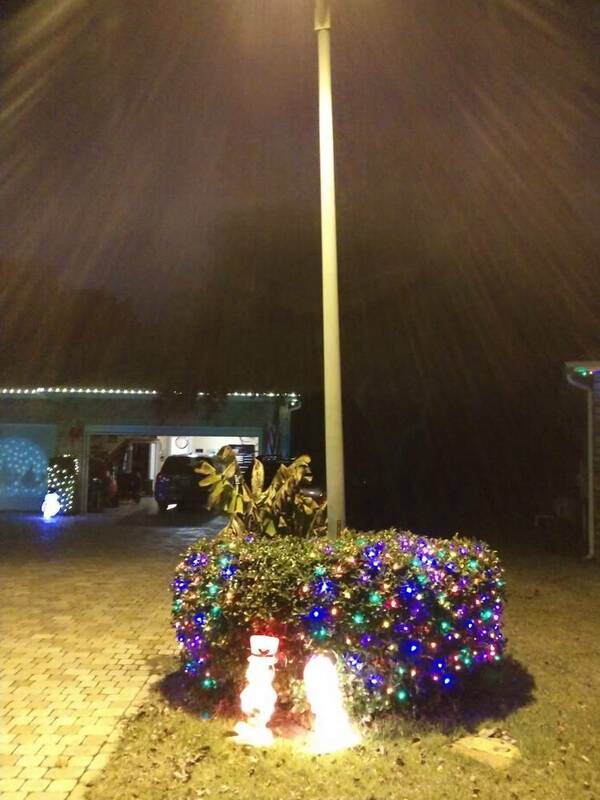 I also have a similar light in front of my home but there is no way I am going to get anywhere near the top. Instead I strung a rope between the garage eaves and the light pole and hung a bunch of lights and ornaments off the rope. You can see from the pictures that we really don't have large front lots so things get a bit crowded plus I had to cut down two large bushes just to have a view from the street for things nearer the house. Picture one and two are his home. Picture three is mine. Sorry but it is afternoon and much of the display is in the shadow of the garage. If the lights to bright I hear your neighborhood kids just accidentally on purpose hit a baseball into it. I'd seen someone the other night in my area wrapped it with lights and also used it as an anchor for a flying sleigh. Pretty neat. Looked like he just wrapped tight his wire so he wouldn't have to drill into the pole. 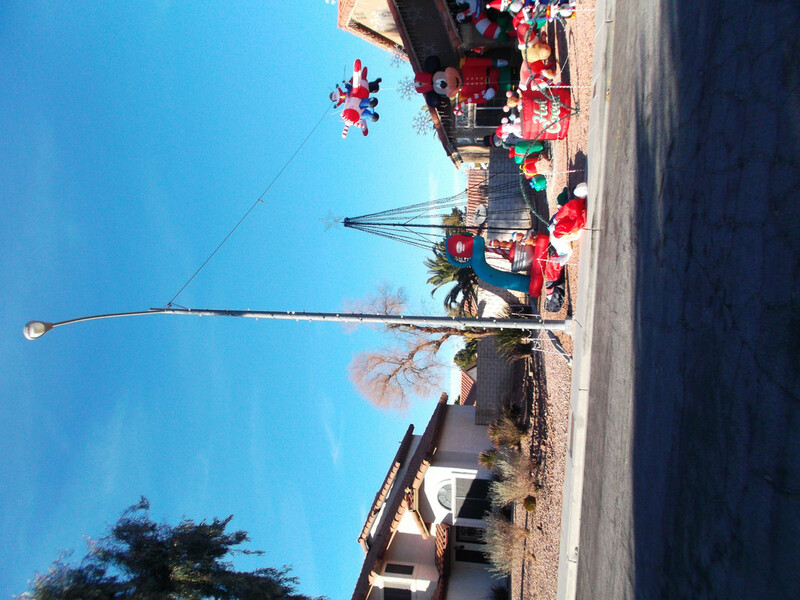 I think the county would take issue with any alterations to the pole. 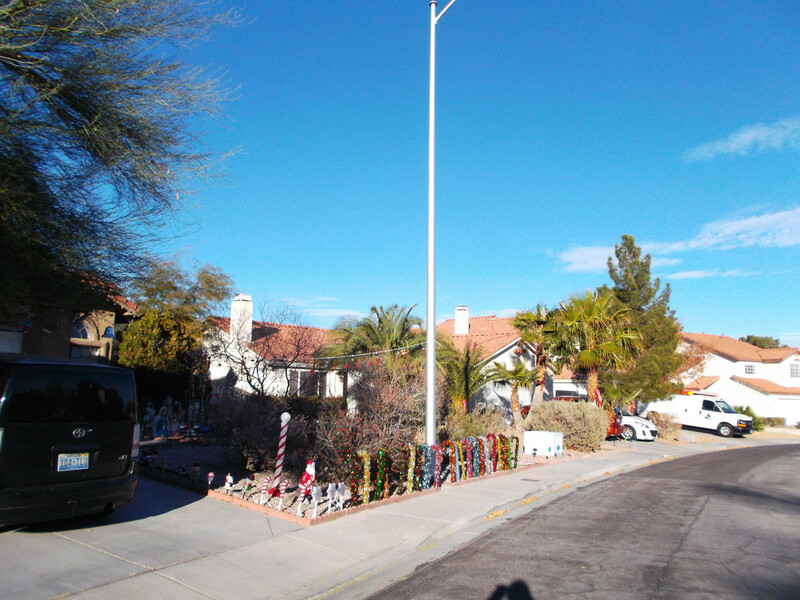 The light and cable are attached where the pole splits so that the light is out over the street. These are sodium vapor lights but I don't find the light is so bright that it detracts from the displays. That kid would have to be a pretty good pitcher to aim and reach the light. It's way higher than the old bare incandescent lights that illuminated my childhood neighborhood. Yeah, it's pretty high. But it's really not too bright. Not ideal, but not awful. Wander if I could find a municipal decoration to put up on it. I have put lights on the one yard for the second year. No body said anything. I did't ask my city council person. He said if I asked the answer would be no. Just put it up. The worst thing would be they would say to take them down. The mayor said my display make the town better. I'll give a creative solution... Embrace it as a design element. 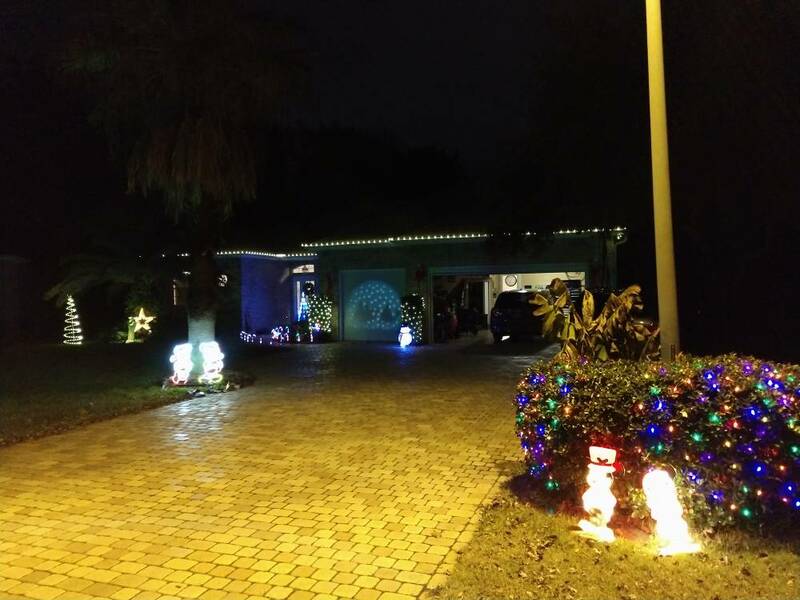 It lights up your driveway pretty well with a warm white or even yellow glow. Flood the walls of your house in that same color with outlines of cool white around the edges of the house, windows, and driveway. The warm-cool mix actually looks pretty good when put together as a theme. As a static display I think that would look pretty cool. Animation would be more difficult if you want total darkness at any time. My street light was replaced by a super bright LED post top light 1000watt equivalent the old one was HPS. I ended up changing the bulbs out in blow mold from 25watt to new LED bulbs 60 watt equivalent. I had an idea to make wood cut out for Halloween and Christmas on that side of the yard. No flood lights needed.